Are you looking to spend your next getaway in a stunning home with exquisite design details throughout? Harbor Moon is it, Trinidad's newest luxury vacation rental, and no expense was spared in the creation of this haven by the sea. 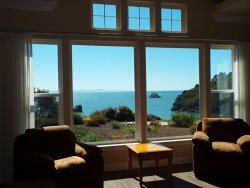 This home sits near Trinidad's Memorial Lighthouse and offers incredible Trinidad Bay ocean vistas. Come to relax and unwind in luxurious comfort with elegantly-appointed spaces. Whether the trip is for a corporate retreat, a ladies weekend, a fishing adventure, or a large family get-together, this home will suit any need. Elegance, nautical treasures, intriguing artistic accents, and top-of-the line amenities create a sense of luxury and comfort like no other. The richness and grandeur of the interior and exterior will meet your expectations. The creative design elements incorporated into this home inspires a modern nautical ambiance that is perfectly paired with the spectacular scenery enjoyed around the estate. The elegance of this home is one of its better qualities however it is also accommodating for families with children or for people with active lifestyles. There are plenty of games and toys for families or large groups to enjoy. The home also features a media center with a 62' flat screen TV that sits above a cozy gas fireplace. Enjoy all of this while resting on the large sectional couch with room for 10. The utmost comfort of the guests is the cornerstone of Harbor Moon! Wake to the bell gently chiming on the bay's buoy, faint calls of seagulls laughing, and the distant barking of sea lions. As sunlight rises over the tree crests on the surrounding hills, the sea stacks are illuminated through enchanted mists and salty spray. If you come during winter months, you'll witness some of the most powerful ocean swells in California. Watch a variety of fisherman's boats come in and out of California's last natural harbor in commercial use, all from Harbor Moon. Sip your favorite beverage during sunset as you relax on the stone sitting wall. A beautiful native plant garden grows before you, a kaleidoscope of hues which complement those of the changing evening sky. Once you decide to retreat to the Master Bedroom through the French doors, be sure to look behind you to the south and relish in the view you'll be able to enjoy from your king-size bed. Open the blinds to reveal an epic view of Houda Point, Cape Mendocino, and wild Pacific Ocean from the comfort of your luxurious new abode. All rates are for Two (2) adult occupancy.